Pearl Mountain Software contacted me several times this year asking me if I would take a look at this app, but due to my busy schedule I refused. 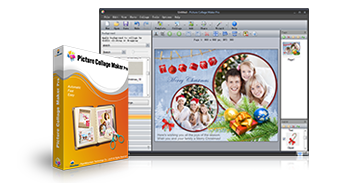 As the holidays got near I found myself needing to do a collage so I decided to take them up on their offer to check out Picture Collage Maker Pro (available for both Windows and Mac). It turns out that this is one of the most useful collage programs I’ve used thus far, and it’s very fast and responsive. There’s lots of free templates available too so that you can hit the ground running very quickly. If you are doing holiday greet pages, scrapbooking, disc labels, sports portraits or more you’ll love this app. It’s dirt cheap and you can download a free trial to see if you like it. I’m actually quite happy to have discovered it and highly recommend it! Click here to learn more and/or order.